We had to mail some important documents to Canada. We figured Fedex is a reputable courier service to we decided to use them. 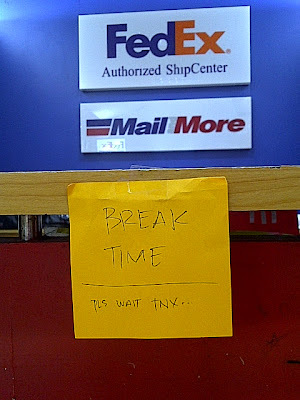 We went to the Fedex / Mail and More branch in Sta. Lucia East Grand Mall since they were open till 8:30pm. When Berto and I arrived, we were not really surprised when we saw this ... again. We often choose Mail and More to deliver for our business since service was fast and affordable. We just found it amusing that we've been to this branch 4 times and we always catch the guy manning the shop on break 30-40 minutes before the shop is supposed to close. It's almost closing time, can't he wait for just a few more minutes? And we think he does this every night. We got there while he's on break, four out of four times! It has got to be more than just a coincidence! I wonder if the branch owner/manager knows about this. It is really poor customer service. Customers are kept waiting for more than 30 minutes and all the while the packages he received for the day are just left there in the shop, unmanned. Anyone can easily hop over the partition and take a package. Tsk tsk. Annoyed as we were, we have no other choice but to come to this shop since they are the only Mail and More branch near our place still open at night. The guy is always apologetic when he comes back, he says he thought no one would come in since it's almost closing time anyway. He said this to us all of four times we were there. We were not the only ones waiting for him. There were others too, but like us, they couldn't afford to reprimand the guy. What if he takes it out on our packages? What if it "accidentally" gets lost in transit? We don't want the hassle. We tried track it when we got home but the system still hasn't updated so we couldn't see our package just yet. The system finally did update the following night. Imagine our shock when we saw that our package will be delivered 5 working days after! We sent the package on April 3 after cut off so it can be considered as April 4, but instead of being delivered on April 6 it was supposed to be delivered on April 10! In fairness, it was safely delivered just today but still, it was so irresponsible to give a wrong promised delivery time. I'm not sure if the personnel didn't really know what he was doing or if he was just unmindful of what he was saying, or if there was a problem in the delivery itself. We called the customer service to report the delay but a certain Nathan coldly told us that whatever we are seeing in the tracking system is correct. He won't give us the standard delivery time to Canada, just that what we see in the system is the correct delivery time. Shouldn't they inform us of the standard delivery time? That's precisely why we contacted customer service. We also noticed that from Cainta, the package transferred to Paranaque, stayed there the whole day, transferred to China then back to Angeles City, Philippines where it stayed for another day before it was transferred to Japan. Is this really the proper route to Canada? Because I think it's hardly efficient and so time consuming. 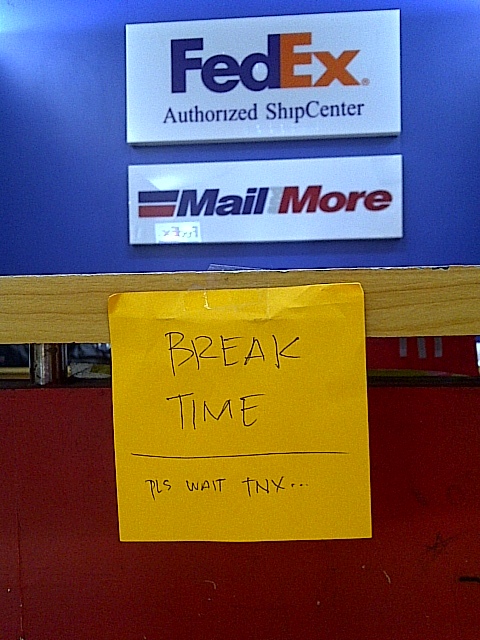 I hope the Mail and More / Fedex Sta. Lucia East Grand Mall will do something about this. We noticed there was only one person in the shop. Maybe that's why he is forced to take a break while on the clock, no one is there to relieve him. Please look into this matter. You are putting your companies' good names in jeopardy. I uploaded this blog post yesterday morning (when I was sure that our package was already delivered hehe). 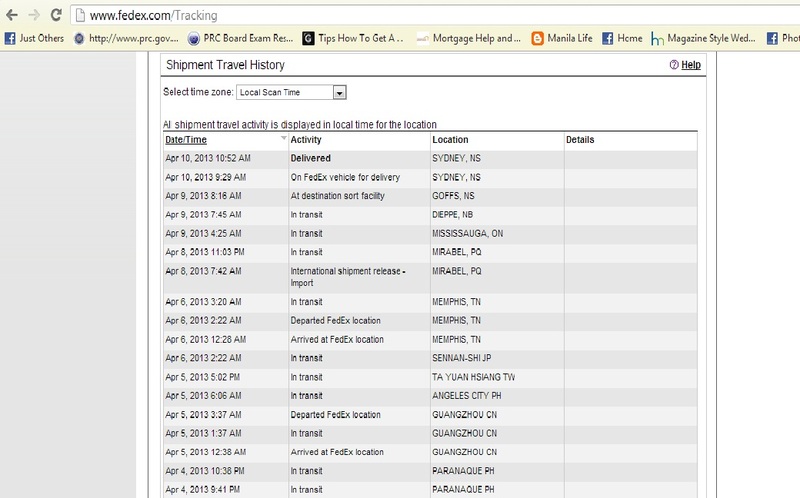 Hubby got a call for Ms. Bing R of Fedex in the afternoon. Apparently they read the post and were investigating the incident. When she called us, she was already prepared with the details of our transactions like the dates, the route, hubby's contact info, even the customer service agents who answered his calls. 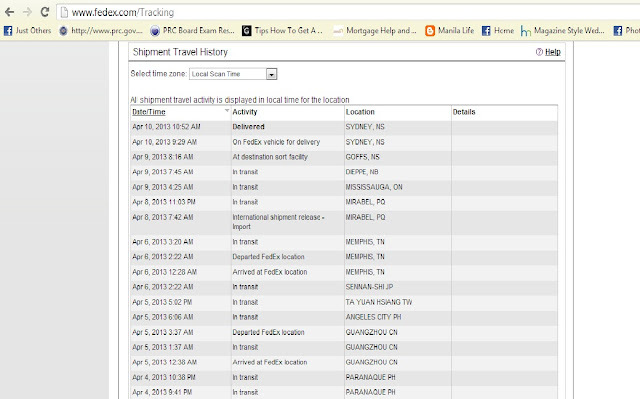 Ms. Bing patiently explained to us the exact route and time line our package took. She got more details about our encounter with the agent in the branch as well as customer service guy who took our call. She also assured us that they will look into the matter. I also got an apologetic blog comment from the President of Mail and More Business Services. Thank you very much. We appreciate your efforts. It is really good to know that your companies still seek customer satisfaction. I would like to believe that this is just as isolated case. I guess it's just too bad we got a double whammy when we encountered an agent who gave us the wrong info and then we called a customer service agent who lacked compassion and concern for customer's needs. * By the way Ms. Bing asked us if the picture on this post is an actual picture. Yes, this is an actual picture taken there at Sta. Lucia branch, but on Feb 16, 2013. That was our first or second time to drop by that branch. I found it absurd that the branch was left unmanned for so long. I had to take a picture. Like I said above we've been back a couple of times since, same scene, different notes. On the night of April 3, I believe he used white paper to let people know that he's on break. Our sincere apologies for your bad customer experience when you send your package to Canada from our Mail and More outlet in Sta. Lucia. We have already reprimanded and called the attention of our Area Business Partner and the agent assigned to the branch. Rest assured this kind of incident will not be repeated. President- Mail and More Business Services, Inc.
We have been using Mail and More to deliver for our business for years. This is the only branch we had problems with. I also send package via Mail and More Sta Lucia and twice naman na naabutan ko naka lunch break sya and ganun nga din naisip ko, wala tao na bantay andali nakawin yung mga naiwan na package sa likod. @roselle - aha! di lang pala dinner break, lunch break din... tsk tsk. there's another branch of Mail and More near sta lucia. its @ MAIL AND MORE Karangalan Village Branch gate 5.
there was a time n close n sila (8:30PM) pru nung kumatok kmi sa knila, they still accomodate us, and explained that they will only received the package pru for next day p n pick up, kasi tapos n pick up s knila that day. at least accomodating sila, kahit pa uwi n sila para d n kmi bumalik d next day.